Hi everyone! I'm so sorry I am several days behind on leaving comments and returning them, I hope to catch up by the end of the week. On to the polish! Blue Light indoors, 3 coats with SV. This is another polish I bought from Grace, I'm glad I did because I got several compliments wearing this at work which almost never happens. 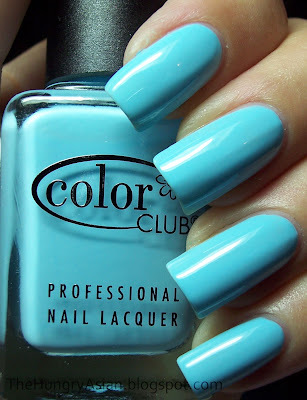 This is a very light blue creme that really made my hands pop, love it. That a gorgeous colour! Love it. I'm about 2 weeks behind on commenting and reading posts... I'm not sure I'm ever going to catch up! Such a great blue! I hear ya on being behind. I'm starting today to try and catch up! I love this colour! You have very well shaped nails. Mine have a slight slant which I can never correct! WoW that is a gorgeous colour! Oh i like the color especially it's on your nails! i agree it makes your hand pop.. I'm wondering, what do you feed your nails to keep them strong without any chipping or 'split ends'??! That is a stunning color on you! I second everyones comment. Your nails are filed so perfectly and I think that too makes the polish stand out. What a beaut! This is an awesome blue. It looks like ChG's "For Audrey". SO CUTE!!! I love sky blue nail polishes. And this looks great on you! Love your nails too! Wow! That's such a gorgeous blue colour! Thank you, haha I feel your pain and I'm only several days behind! Thanks, lol yeah it feels impossible to catch up. Thank you, I have a few nails that curl myself on my other hand! Thank you, I too thought that after applying this! I think For Audrey is slightly more green. love your nails. Share your nail growth secrets. Oh I love this colour! I first saw it on Olivia C's blog and got it the same day. It is a heart stopper! <3 Stunning on you Kae, as always. very nice color! i love it. and I love your nails too. they are perfect absolutly perfect. Thank you, definitely this is a great color to own! Love this shade of blue on you. I haven't ordered any of that collection. Now I'm thinking I need this shade. Kae you are bad making me want this. Not that I need much encourgement! I love light blue shades! And this one looks perfect on you! Your nails are beautiful! What is the name of this color club polish? It's beautiful!